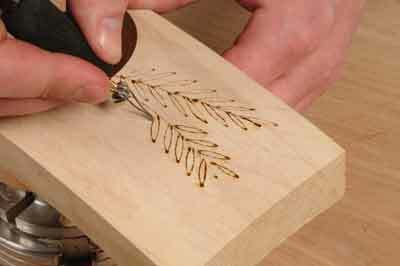 Pyrography is a technique that has myriad uses, and the technology has moved on no end from using a hot poker. Pyrography is used a lot within the bird carving fraternity, where bird carvers create feathers and so on. Its value and versatility is still to be fully integrated into the turning world, although there are a few proponents out there who really push the boundaries as far as pyrography techniques are concerned. This new Razertip SS D10 Burner is unusual in as much as it allows two handpieces to be fixed to the unit, which means you can have each setup with a different nib, resulting in different effects being created - most models available only have one handpiece fixed at any one time. When I took this unit out of the box I thought that the machine looked reassuringly well built. The instructions provided are clear and give you all the information you need to get started, and all the pieces supplied fitted. 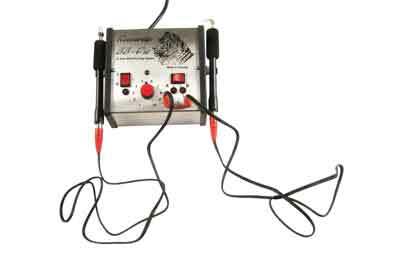 The handpieces have a long, flexible cable with a single plug at one end to pop in the appropriate hole on the main console. Once both handpieces are fitted, there is a toggle that will switch which tip will be heated at any one time - so swapping is very easy. There is a numbered dial used to regulate the heat - No.1 is a low heat ideal for subtle shading - and No.10 is fierce and very hot, resulting in the tips becoming bright red for scorching. The tips that can be bought to fit the handpieces vary in thickness from pre-made scalpel type, to wire which you can buy and make to your own requirements. So the range of heat settings are necessary to vary the heat to create the different effects and counter the thickness of the wire. Using the item was a doddle. Swapping pens was as simple as switching a toggle. Various tips can be bought to suit differing requirements, allowing the user a great degree of flexibility. The handpiece is comfortable to hold and easy to use. The heat control is responsive and provides an excellent range. Fixing the tips is easy â€“ just loosen two screws, remove the tip, slide in a new one, and tighten the screws. I liked this machine, especially having the option of plugging in two handpieces, ready to use. The unit is simple to use and very effective. At £160 it is not an impulse buy, but it is something to consider. As a first time user of the machine, I found the controls easy to use and intuitive. As a novice, it took a while to get the hang of getting the temperature of the tip and the speed of movement across the timber necessary to get a good result, but the longer I used the machine the more comfortable it felt. All in all I found the experience enjoyable and the machine easy to use.